In this workshop, we will try out several experiments for generating new poems. We will make poetry flip books, practice “translating” ourselves onto the page, and explore the process of honing our craft by creating multiple variations of a single piece. We will also work on the fundamentals of making a poem, including tension, imagination, and surprise. Participants will take home as many potential poems as possible, to keep writers’ block at bay for months to come. No prior poetry or writing experience necessary! A presentation of Paol Keineg’s poem from Bad Language and my animated translation, which will be on display at the Granoff Center. This presentation is part of the Conference for Research on Choreographic Interfaces. Reading poems for the launch of No Tokens issue 7. 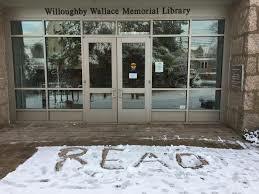 Poetry reading at Willoughby Wallace Memorial Library, Stony Creek, CT.
Panel at Sous les Pavés, Conference on Contemporary French and Francophone Literature, Brown University. Chaired by Alice Kaplan, with Annabel Kim, Morgane Cadieu, Emma Ramadan, and Anne Garréta. Blacksmith House Poetry Series, Cambridge, MA. Christophe Boltanski will read from my translation of The Safe House and discuss the book. 6:00pm, Maison Française East Gallery, Buell Hall, Columbia University. 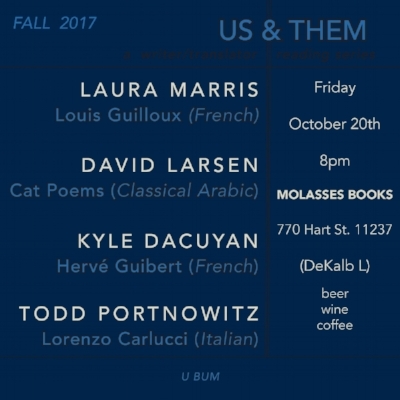 Us & Them reading at Molasses Books. I'll launching my translation of Blood Dark and reading original poems with some wonderful writer/translators. Triste Tristan and Other Poems launch at Brown University. Reading with co-translator Rosmarie Waldrop and poet Paol Keineg. 7:00 pm, McCormack Family Theater, 70 Brown Street, Providence. 7:30-8:30 pm. 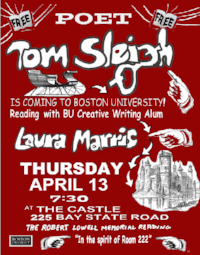 The Castle, 225 Bay State Rd., Boston University. Presentation and reading from my the translation with the author. A reading series for writer/translators to share original work and new translations. With members of Sheep Meadow Press. Poetry series hosted by Megan Fernandes.